Myles Garrett rushes during this camp rep facing Austin Corbett and Shon Coleman. 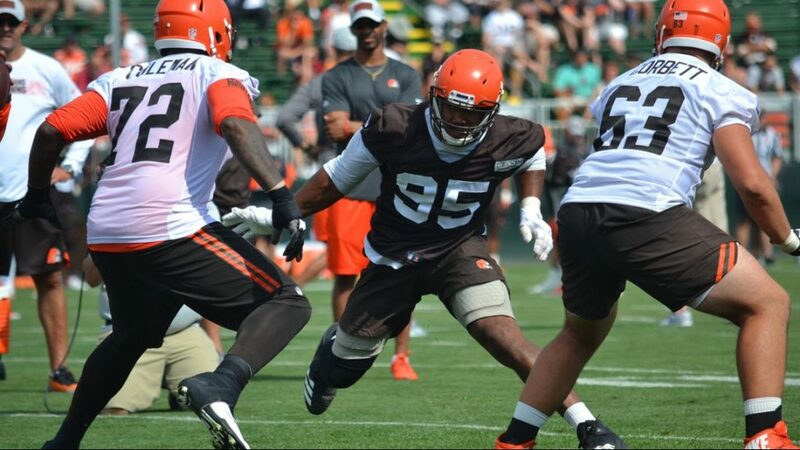 “Hard Knocks” 2018 Browns debut, 10 p.m. HBO. It’ll be fun to see how the series highlights the Browns, their fan base, and various plot lines. It will be nice to see a wider audience exposed to the Browns, offering a market share opportunity rarer in this atomized age of inattention. It’s not like the late ’50s, when the Browns alone had their own syndicated TV network while the rest of the league shared CBS. Thu. Aug. 9 — Browns preseason debut at NYG, 7 p.m. Browns don game jerseys in Jersey game. Preseason winning streak meets Giant test. Fri. Aug. 17 — preseason game 2: Browns host Bills, 7:30 p.m. Tyrod Taylor‘s tuneup against his ex-team. Thu. Aug. 23 — preseason game 3: Browns host Eagles, 8 p.m. FOX national game. Expect a few tangled dissections of the 2016 Browns/Eagles trade and all it implies. Thu. Aug. 30 — Browns preseason finale at DET, 7 p.m. I plan to be there. Which team’s copy of the Great Lakes Classic trophy will deserve to be hauled out of storage and displayed? Sun. Sep 9 — Season Opener: Browns host Steelers, 1 p.m.
Thu. Sep. 20 — Cleveland hosts Jets on NFL Network, 8:20 p.m.
Sun. Nov. 18 — Bye now: next weekend with no Browns game scheduled. So there’s some of the skeleton. Let the Browns fatten dem bones, earn their stripes, rise to the moment. In the ~ what is this now?! ~ the Hardland of America. We’re an update on yesterday’s Chevrolet, I guess. Insofar as their PR spiel synergizes with Browns Plainly vibe we’re cool with it. Until we get annoyed at being sold some generalized approximation of our own purported identity. For now, there’s plenty to tune into, so enjoy the consolation of summer’s slow demise: football season. This entry was posted in fan focus and tagged media on August 5, 2018 by Dave Algase.